doyounoah: Watch Free Channels You Don't Even Have To Pay For! Watch Free Channels You Don't Even Have To Pay For! If you're like me then TV is very on demand, I watch it when I choose to. Television schedules are so "back in the day". It seems like yesteryear when Nickelodeon, Trouble and MTV Base were the channels I watched repeatedly as a mere tweenager. I rarely even watch Sky and I don't even have a television in my bedroom *shock horror*! It's all about iplayer, channel4 catchup and OVguide for all those exclusive episodes of Heroes, The Hills and Gossip Girl. (wink wink) Streamed or downloaded, evening or day, the choice really is yours. And surprise surprise guess what else I've stumbled across?? 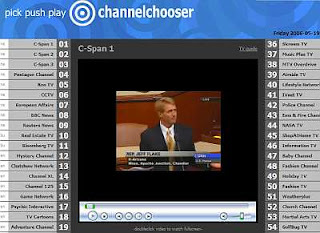 Channel Chooser lists LOADS of channels you can watch online from the comfort of your computer screen whenever you want. Kudos to moi! My favourites so far are Invincible TV, (British "urban" music and shows) CNN (knowledge is power y'all) and HBO (spawns the Wire need I say more?) http://www.channelchooser.com/index.php?watch=Invincible%20TV&id=170&get=1 For more info check: http://www.channelchooser.com/ www.ovguide.com Toodles!